Well Gustav took the weekend headlines but in the end it caused trouble in places where no doubt the residents wished it went elsewhere; not the market cared as oil shed a few dollars (although it was natural gas prices which went on the rip during Katrina, oil prices barely budged). There is no doubt that a recession is being priced into the stock market. Investors Business Daily just reported that '90 % of consumers believe that the economy is in recession.' But if a recession fails to emerge, then this market will be extremely oversold on a faulty economic outlook. The statistics continue to mount against the possibility of a recession as indicated by the first and second quarters of GDP. The rate cuts should come to the aid of the third and forth quarters. 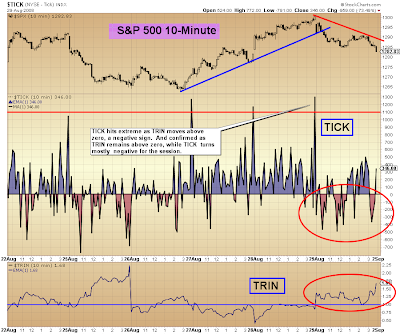 The intraday charts suggest more selling early next week. 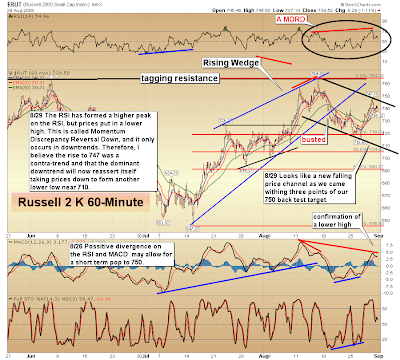 The 60-minute chart of the Russell 2K got a momentum discrepancy reversal down (MDRD). That means that the latest RSI peak that was made during this last minor high at 748, was higher than the RSI peak during the mid-August high of 764. Thus the recent bounce on the Russell and the QQQQ is likely a contra-trend on the intraday charts, which means that we may sift lower to test the lower boundaries of the new falling price channels on the 60-minute charts. I am watching these two very closely, because the small caps and technology has been the leadership since the July lows. There are many problems with this current rally continuing. The Aroon on the S&P 500 and the DJIA daily charts is not supporting it. The MACD continues to crisscross its signal line on the MACD right at the zero line on those same daily averages, giving no clear directional signal. But the August peak is lower than the peaks made in May, thus we do have a lower MACD peak on both averages should the MACDs ultimately turn bearish. The biggest problem is the volatility index (VIX). 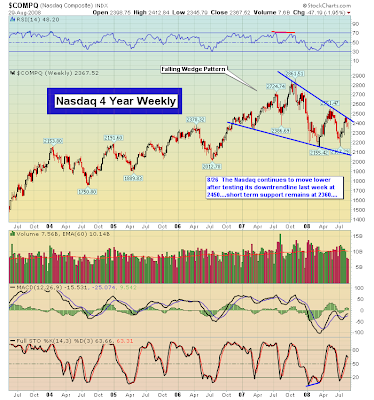 It continues to have a bullish falling wedge pattern on the daily chart. 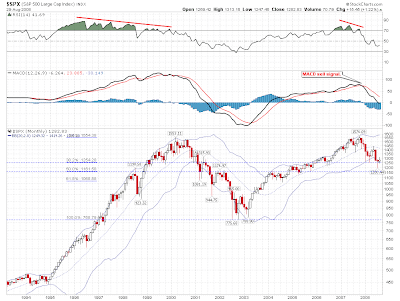 The MACD looks ready to start recycling back up and there is a bullish divergence lurking on the stochastic. 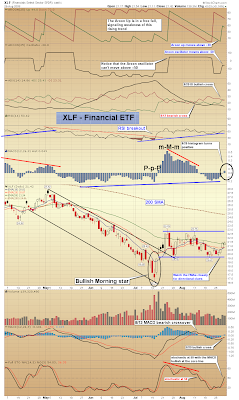 Its 60-minute chart looks bullish as well, with the MACD coiling throughout the forming of the wedge. 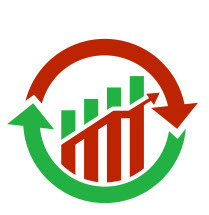 To complicate matters there are several mixed signals on the daily and weekly charts. The 10-days EMAs are still above the 20-day EMAs, but prices close below the 50-day EMAs on the DJIA and S&P 500 after just moving above them. This is now the forth failed attempt for prices to climb above the 50-day EMAs on the DJIA and S&P 500 through the month of August. Additionaly, the 10- and 20-day EMAs have been unsuccessful in crossing above the 50-day EMA. But the DJIA closed on Friday just below its 20-day SMA, and the S&P found support above it. Other mixed signals include a bearish triple M pattern on the S&P 500 daily chart, but the RSI trendline continues to hold up. The directional movement indicator (DMI) continues to see the DI lines weave back and forth marking that prices are trend less. But the rising trendline off the last minor continues to remain in tact. The DJIA and S&P 500 still could test their July lows. 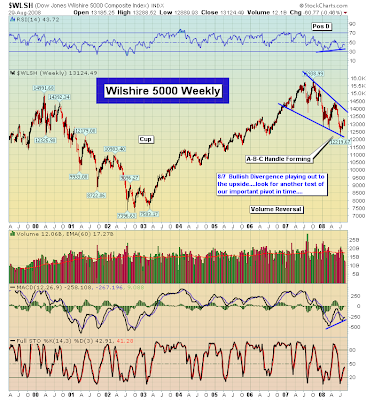 The weekly charts QQQQ and S&P 500 are sending mixed signals as well. The Qs got a bearish triple M pattern, as it got a lower histogram bar. Moreover, the we have a lower histogram tower than the last, confirming the lower high on the price chart. But on Friday the S&P 500 saw its histogram move into positive territory for the first time in months. It could loose steam though, and follow the QQQQs lead and turn south again for a short period. But the S&P's 500 MACD is trying to get a bullish cross here. 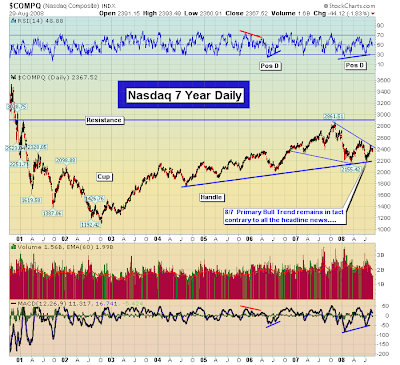 It has been a while since I ran a chart of Robert New's, but here is the 7-year Nasdaq chart. Note *new* bull trend given it was necessary to redraw the trendline to account for new 2008 lows, bending the truth a little saying the line is "in tact". I would call it a new phase since 2005 and 2006 lows are no longer defining the trend. Adopt fan line principles; three strikes and your out - I would call this strike two (2004-2006/2004-2008/2004-????). 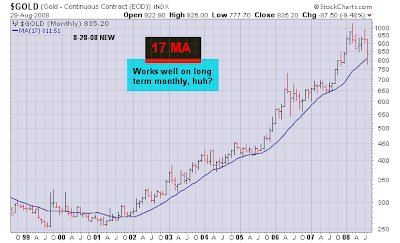 From Joe Reed, will gold find support at the 17-month average? 8/30 -- Thanks for bearing with me on this one. It appears that end of month buying threatened to distort the channels, but in the end, the downchannels held (though a few ended up being modified from where they were intially). That will happen now and then, but at least we find out fairly quickly. Meanwhile, except for oil and gold and Canadian stocks, we should brace for more downside in the near term. 8/28 -- This one really has me scratching my head. I redrew the purples to their former, flatter slopes, but there is still a possibility that we are now back in short term uptrends, and in one case (SPX), the original green uptrend may still be operative. Meanwhile, it was low volume and it is end of month. In addition, VIX looks poised to rise and there is healthy premium in the VIX futures for September. I think we'll get a much better picture of the true state of things after the holiday weekend. 8/27 -- I was surprised by the Dow's move upward through the red mini today, but it was contained by the purple downtrend line, and it was in the other charts as well. So, the picture has not changed. The SPX shows best what is happening now as the former green upchannel and the new purple downchannel are overlapping and both still having an effect on the market. 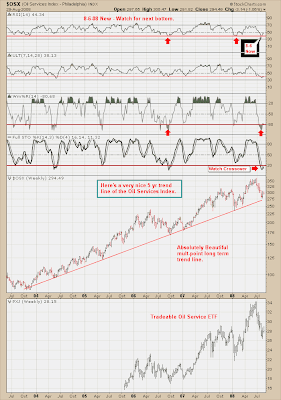 8/26 -- All of the short term charts of US indexes are in downtrends except for gold and oil. And the downtrends are steeper than originally thought. The long term charts show mini upchannels off the July lows that are either now breaking or threatening to. VIX bounced off a low and is rising...and there is still healthy premium in the VIX futures. Oh, and don't forget that we are entering the softest time of year soon. I'd say its pretyty difficult to find anything to be bullish about at the moment.